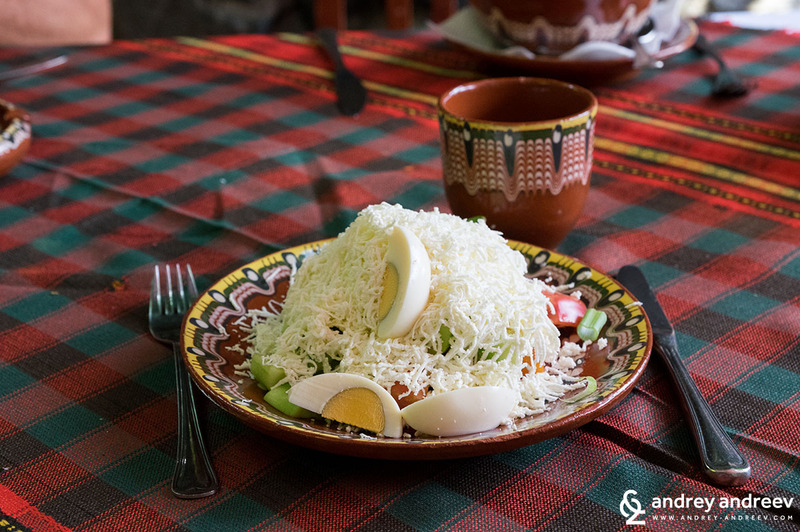 If you are planning a trip to Bulgaria, you have probably seen pictures of delicious meals and have read of the amazing taste of Bulgarian cheese, Shopska Salad and of course, Bulgarian yoghurt. Beyond any doubt, it is a wonderful idea to go shopping for some local delights as soon as you arrive. However, it is not unusual to get into a trap that can ruin your first experience – for example buying the wrong product or a low-quality one. 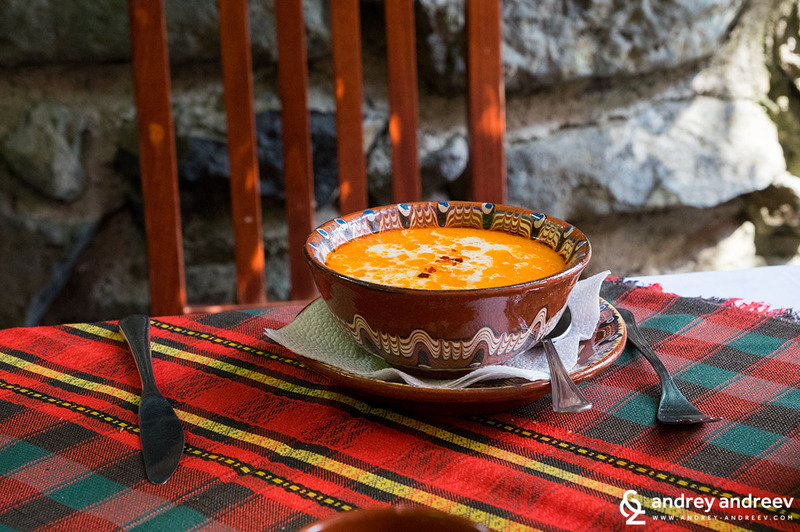 We are always sad to hear about such experiences because we know how amazing traditional Bulgarian food can be. 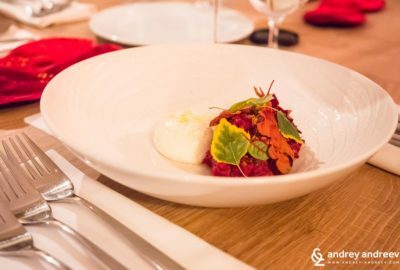 This is why we decided to write a guide to Bulgarian food tasting. Below we will reveal some things you should know before heading to the supermarket or the restaurant. We will also give you some tips about Bulgarian drinks, because we know how important they are to the whole experience. Hint: Bulgarian wine can be amazing, keep reading! Bulgarians are generally meat lovers and the most popular meals here are not vegetarian, despite some of them have also vegetarian versions. Veganism is not traditional either despite being very trendy recently. It is fair to start with yoghurt – after all, Bulgarian yoghurt is known around the world and actually, its biggest fans are Japanese people. 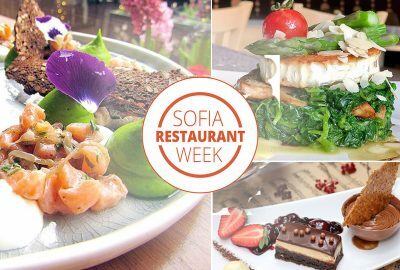 It is indeed a wonderful food to try – it tastes fresh and soft and is proven very healthy, thanks to its special good bacteria that grow only in Bulgaria. 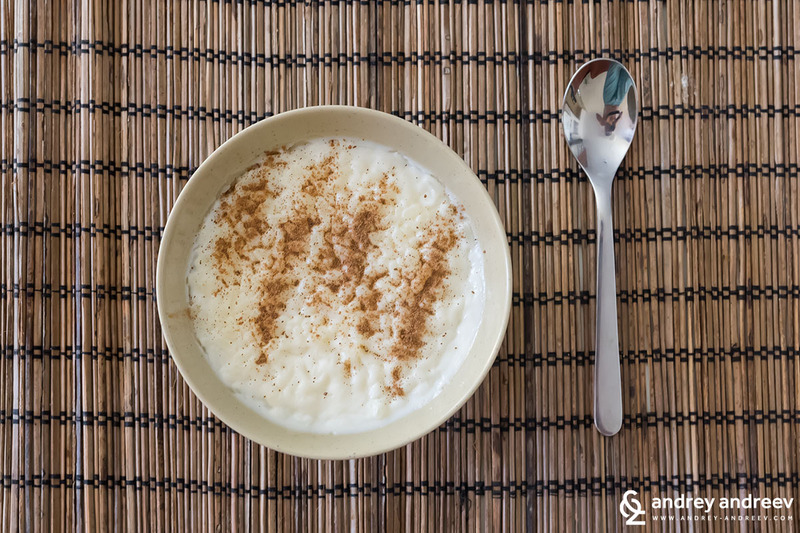 If you have tried Greek yoghurt earlier – Bulgarian yoghurt is similar, but usually with less fat content. The best and cheapest way to try Bulgarian yoghurt is just to buy it from the supermarket. Usually a bucket of 400 g will cost about 1 lv (0.50 EUR). Try the varieties with 2% or 3,6 % fat content – they are the most traditional. There are tens of brands of Bulgarian yoghurt so it is hard to say which one is the best – it depends on your taste. You can also buy good yoghurt in the small dairy shops – very popular in Sofia and other big cities. 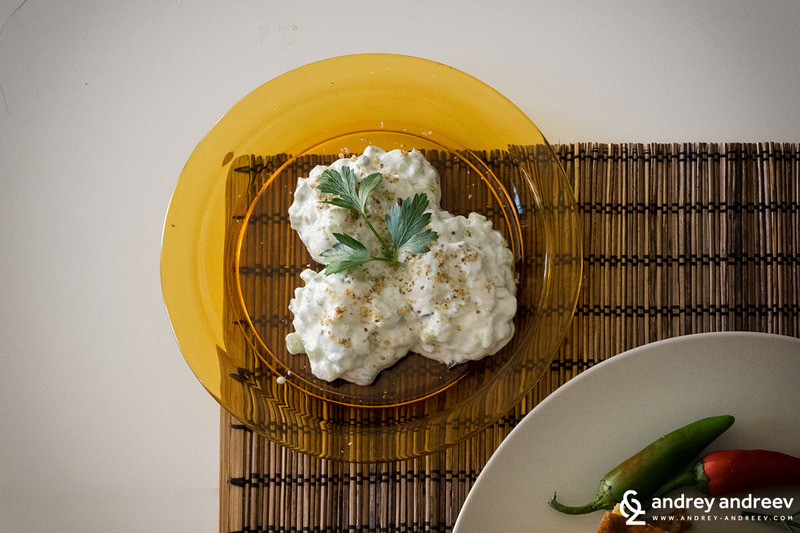 Bulgarian yoghurt is usually eaten alone but it is also served with stuffed peppers or mussaka (I will tell you about it later in this article). It is also served as dessert, mixed with honey and walnuts, or with some jam. We love eating it for breakfast with cereal or fruits/honey/jam. 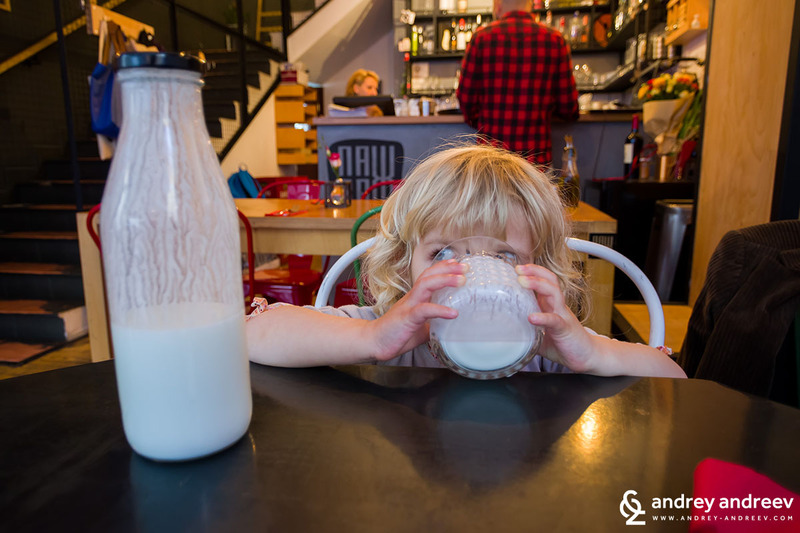 Another traditional thing related to Bulgarian yoghurt is Ayran (Айрян) – it is actually Bulgarian yoghurt mixed with water and sometimes salt. It is very refreshing drink for the summer. You can do it at home or buy it in a bottle from the supermarket. Also, in most restaurants you can order a glass of Ayran as a drink. Bulgarian white cheese is almost as famous as yoghurt. 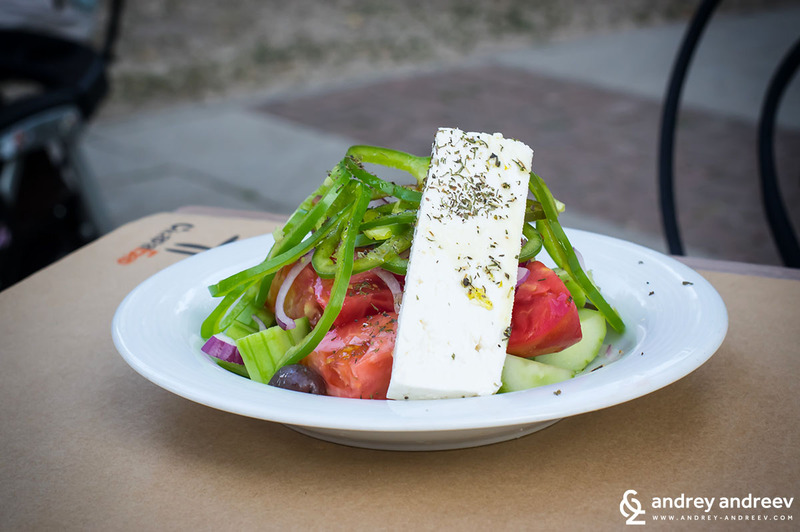 It has something in common with Greek Feta cheese but again it differs a lot. You can buy it in any supermarket or dairy shop. As there are tens of brands on the market, it is really hard to pick a good one from the first time. Usually the cheapest cheeses contain some vegetable fats (palm oil in most cases). Even if they don’t, they are usually less mature and with more water content. I would advise you to try a cheese costing more than 10 lv/kg – in most cases, it will be good. However, expect it to be salty. On the market, you can find cow cheese, sheep cheese, goat cheese and sometimes buffalo cheese. Cow cheese is most common, but the others are worth trying, too. Cheese is usually served atop our most famous Shopska salad. 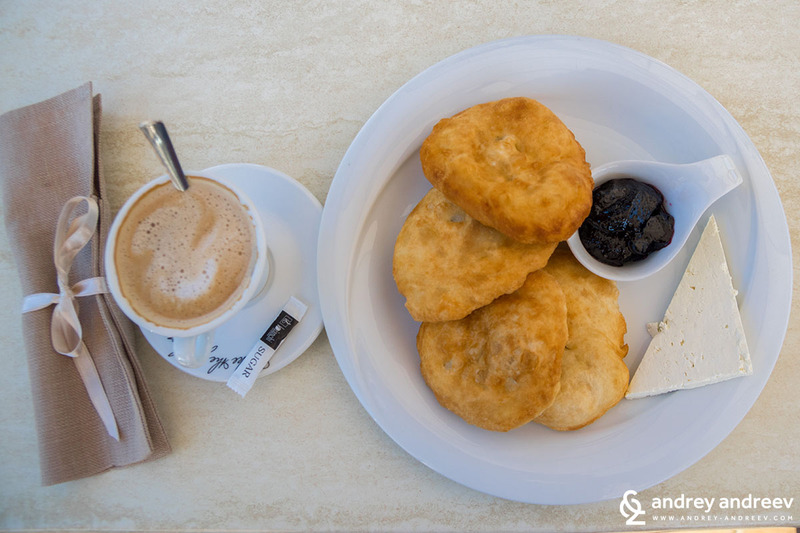 A typical Bulgarian meal containing white cheese is Sirene po Shopski. It is also served for breakfast with pancakes, toasts, etc. White cheese is an essential part of Banitsa – keep reading. 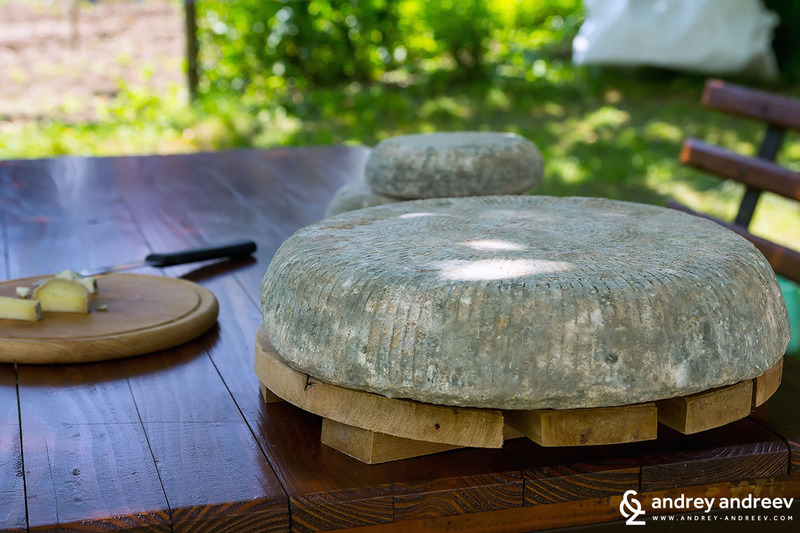 Another traditional cheese in Bulgaria is our yellow cheese named Kashkaval (Кашкавал). It is similar to Gauda and it is quite popular household product in Bulgaria. There are two most common varieties – from cow milk and sheep milk. Good news for VEGANS – this is purely Vegan. Lyutenitsa is something like tomato-pepper chutney, sometimes containing eggplants, onions, carrots and other vegetables. Almost every housewife has her own recipe for lyutenitsa. In taste it is similar to Ayvar (a popular tomato-pepper chutney around the Balkans). You can spread it on a toast and it goes pretty well with grilled meat, especially with kyufteta and kebapcheta. You can buy it in any supermarket – again there are many brands and it is hard to pick the one that will fit your taste. In general, do not buy the cheapest one. 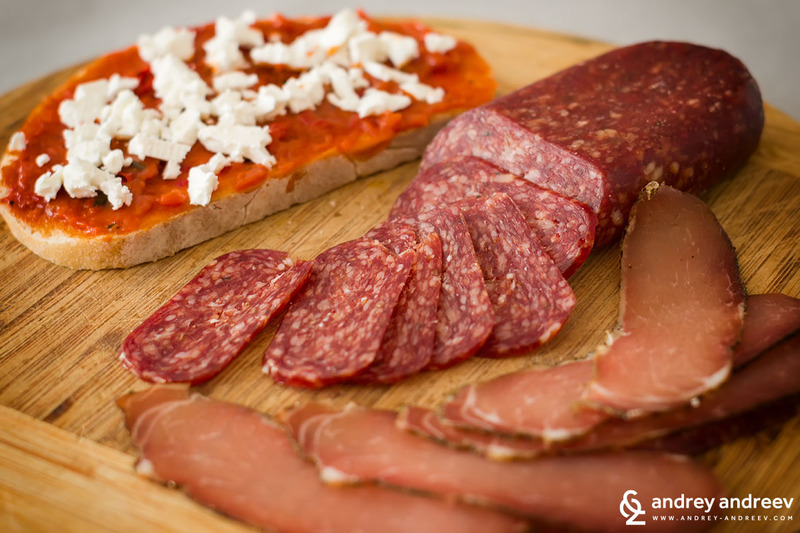 This dried pressed spicy sausage is counted a delicacy and Bulgarians adore it. It goes well as a cold starter with red wine. It is also widely used on sandwiches and even pizzas. If you like snacking with bread, you must try it with Sharena sol. 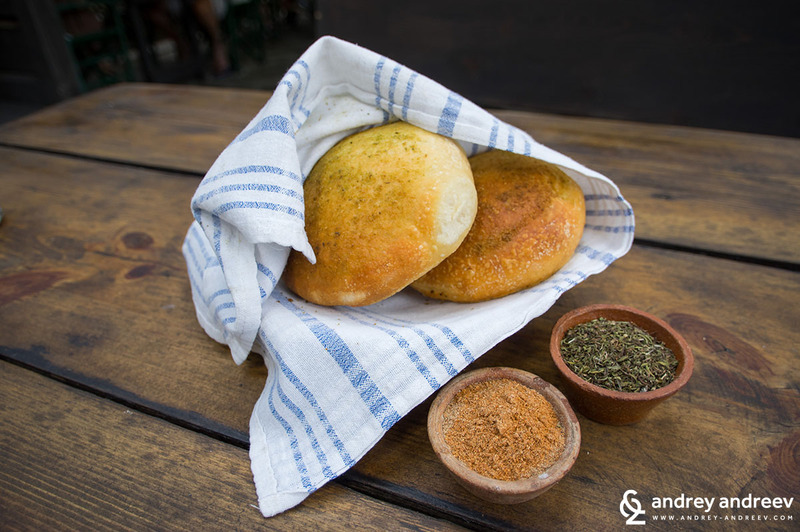 It is not a food itself but rather a typical regional mix of herbs that goes amazingly well with bread. You will find it on the table of the traditional restaurants and in every household. Just dip the bread in Sharena sol and enjoy the food of the poor. One of the simplest and more delicious foods in Bulgaria. Usually contains fresh tomatoes, cucumbers, onions, peppers and grated white cheese atop. Dressed with sunflower oil and vinegar in its most traditional version. 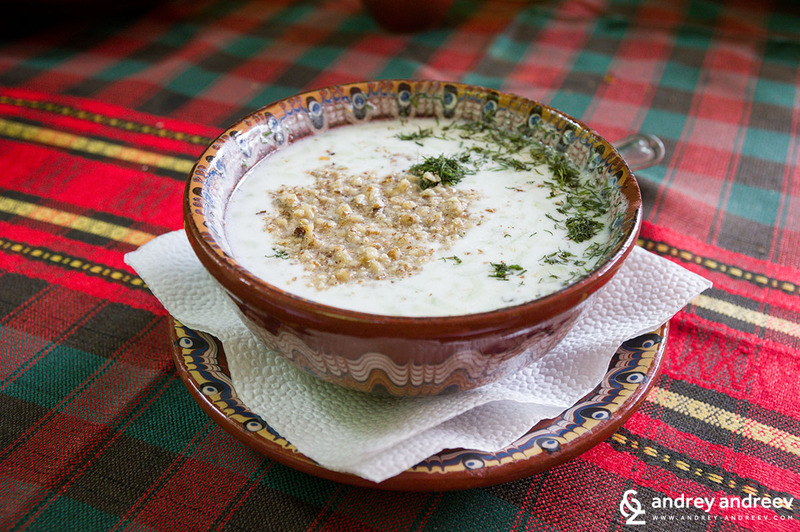 It is consumed daily by most Bulgarians – we absolutely love it! This is a salad made of yoghurt and cucumbers, with or without garlic and dill. Very similar to Greek Tzatziki. You can order it in many restaurants and also buy it in a box from the supermarket. Many people argue if this is a food or drink but it is technically a cold soup made with yoghurt, cucumbers, garlic, dill, walnuts, sunflower oil and water. It is refreshing and light, and some people prefer to drink it in a glass. This soup is especially popular among drinkers. It is known as a universal medicine against hangover but to be honest, we have never counted on its “healing” powers. 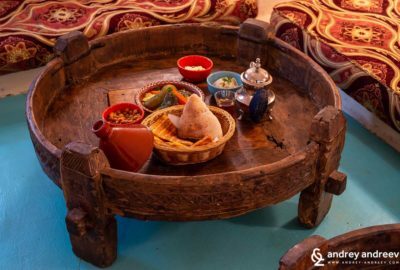 Shkembe chorba is a controversial meal – you love it or hate it. It is usually served with vinegar and garlic. 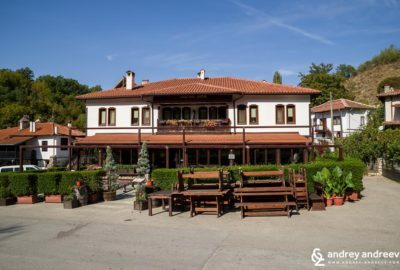 You can try Shkembe chorba in traditional Bulgarian restaurants in Sofia and the big cities and in many regular restaurants in smaller towns. This is a popular soup containing the usual vegetables like onions, carrots, peppers, and small meatballs. Very common among Bulgarians and present in the menu of many restaurants. Bulgarians love Chicken soup (Пилешка супа), Beans soup (Боб чорба), Potato soup (Картофена супа) and Lentils soup (Леща). I do not know whether they are a traditional Bulgarian meals but they definitely have some Bulgarian scent when prepared in our country. If you have been to Serbia or Bosnia or Macedonia or Turkey, you are probably familiar with the Balkan grill. 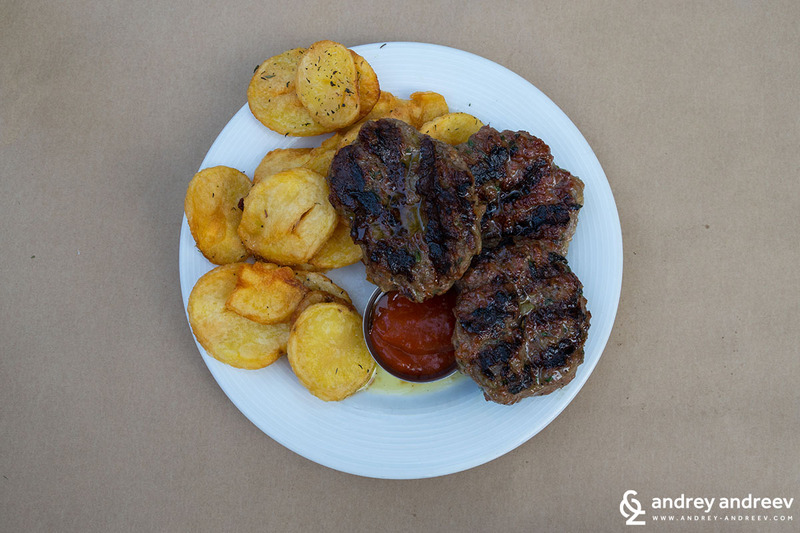 Bulgaria is also a grill-loving country and had its own traditional grill specialties. The most loved one are kyufteta (кюфтета – meat balls) and kebapcheta (кебапчета – meat sticks). 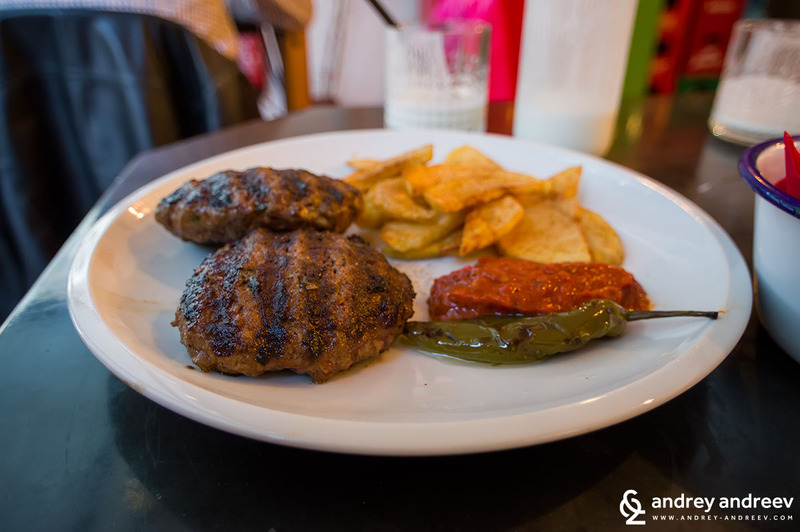 The taste is similar and one of the main differences is that kebapcheta usually do not contain onions. And the shape, of course. They are usually served with Shopska salad, fried potatoes, lyutenitsa. You can try grill almost everywhere, even on the street. And in almost every restaurant. 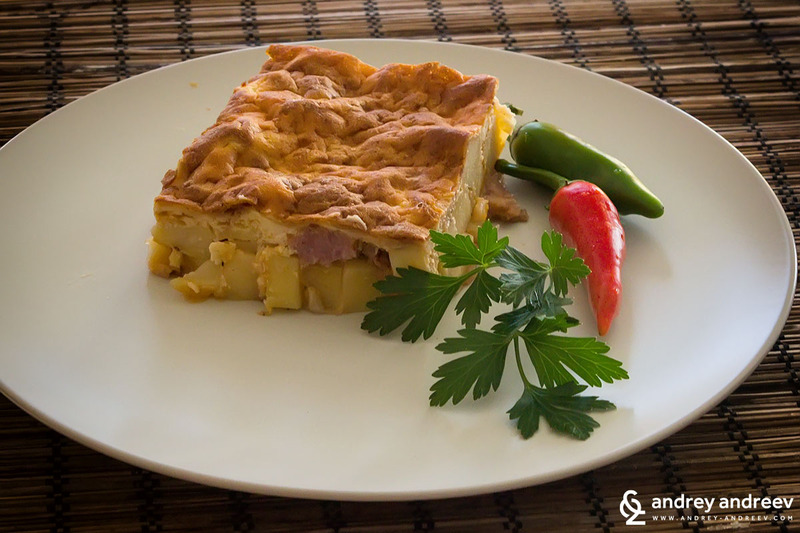 Mussaka is a meal prepared with minced meat, potatoes, onions, tomato sauce, covered with a layer of eggs and yoghurt (Here’s the Bulgarian Moussaka recipe). Usually served with fresh yoghurt. It is another household meal, especially in the cold seasons. 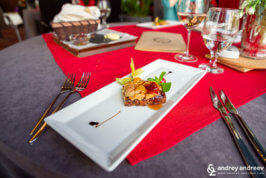 Unfortunately, it is usually out of the menus of restaurants, except some very traditional restaurants. However, it is often present in the lunchtime menus of many restaurants on weekdays between 11.30 and 15h. 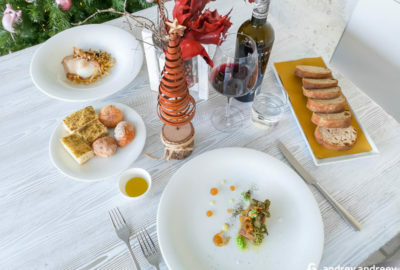 If you manage to find such restaurant, you will also benefit from the wonderful prices of these lunchtime menus. However, if they see you are not speaking Bulgarian, they might not bring you the lunchtime menu so you should better ask if they have one. Peppers are among the products loved by Bulgarian people and we have several very popular and traditional meals with them. One is Peppers stuffed with cheese and eggs (Пълнени чушки с яйца и сирене). A variety of this is Burek Pepper (Чушка Бюрек) – a grilled pepper stuffed with eggs and cheese and then breaded. The other version is peppers (usually red) stuffed with rice and meat or just rice (Пълнени чушки с ориз). From the above, the most common in restaurants in Burek Pepper (Чушка бюрек – Chushka Burek). One of the most loved pastries by Bulgarians. They love it both for breakfast and even dinner, they make it both on normal days and on holidays like Christmas. Dough, eggs and cheese are the main products. You can buy varieties of Banitsa in every bakery but there is nothing like the home-made. So if you are visiting a friend in Bulgaria, ask him (or his mother or grandmother) to make some for you. Technically, this is just fried bread dough. Not too healthy but very delicious. Usually served with white cheese but also goes well with honey, jam or powder sugar. 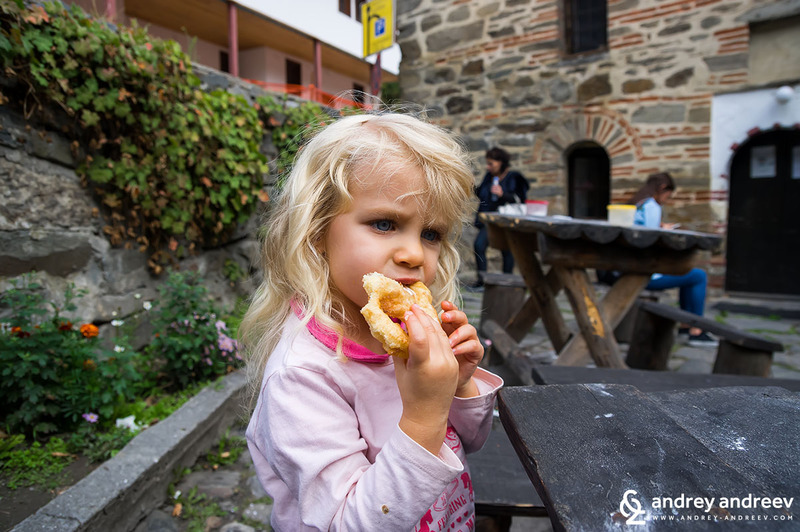 An interesting and very special place where to eat mekitsi is the Rila Monastery. 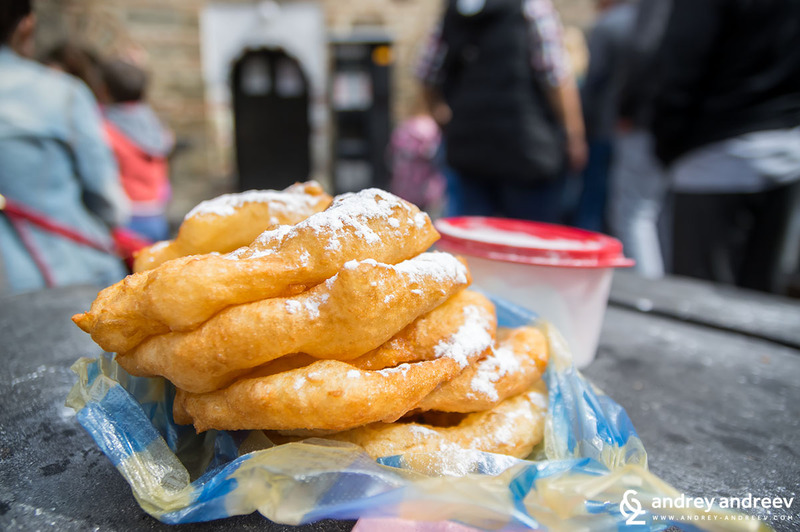 You can try the delicious “fried bread dough” with sugar and you will love it. An amazing place to have maybe little strange but amazing breakfast. Of course, you will enjoy the Rila Monastery – the largest and most famous Bulgarian monastery. 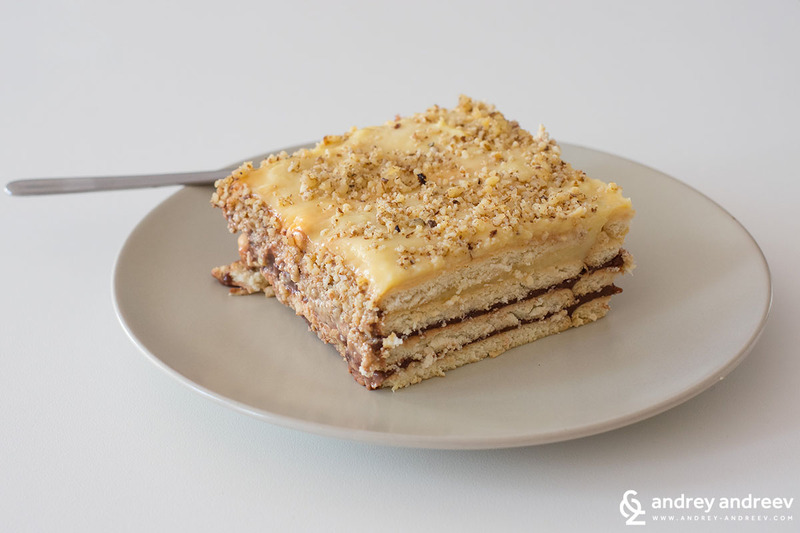 This simple and delicious cake is a favourite of generations of Bulgarians. Usually prepared with plain biscuits and a cream of flavoured starch, sugar and milk. Very easy and very delicious. Many varieties are offered in the sweet shops and restaurants. Another favourite of Bulgarians. I don’t know if its origin is Bulgarian but most people love it. Baklava (Баклава), Turkish delight (Lokum – Локум), Rice porridge are also loved by generations of Bulgarians despite we do not pretend to have invented them. We start straight from the hard drinks but in Bulgaria rakia is more popular to drink than water, especially in smaller towns and villages. Many people produce it themselves and do not imagine a dinner without a glass of rakia. Of course, rakia is a must on every party. It is a strong brandy, usually from plums or grapes, which flavor vary widely. However, its chilly taste cannot be missed and if you are not used to drink hard alcohol, try it carefully. Many Bulgarians indeed produce home-made wine so it is quite a popular drink here, too. 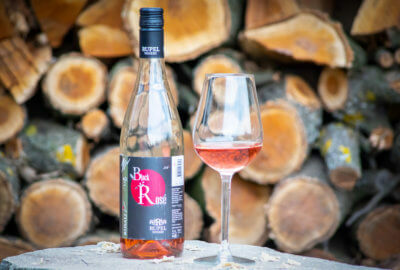 However, I would suggest you to try wine from a licensed Bulgarian winery – there are tens of these around the country. My best suggestion is actually to visit a winery and do some wine tasting, but if you do not have the time and will, just order a glass or bottle of Bulgarian wine in the restaurant. Or if you feel like home drinking, buy from the supermarket of from a wine shop. 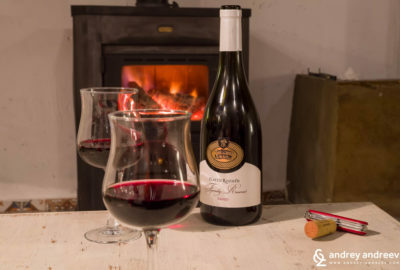 Traditional Bulgarian grape varieties include Mavrud, Melnik 55, Shiroka Melnishka loza, Dimyat (Dimyat you can try in Maryan winery) and others. 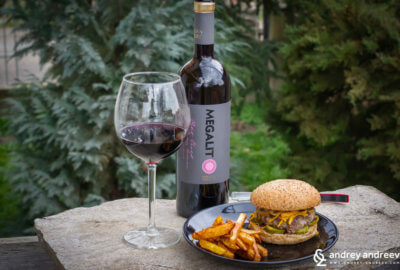 Mavrid and the Melnik varieties are highly appreciated. Of course, most wineries produce wonderful wine from traditional varieties like Merlot, Cabernet Sauvugnon, Pinot Noir, Sauvignon Blanc, Chardonnay, etc. 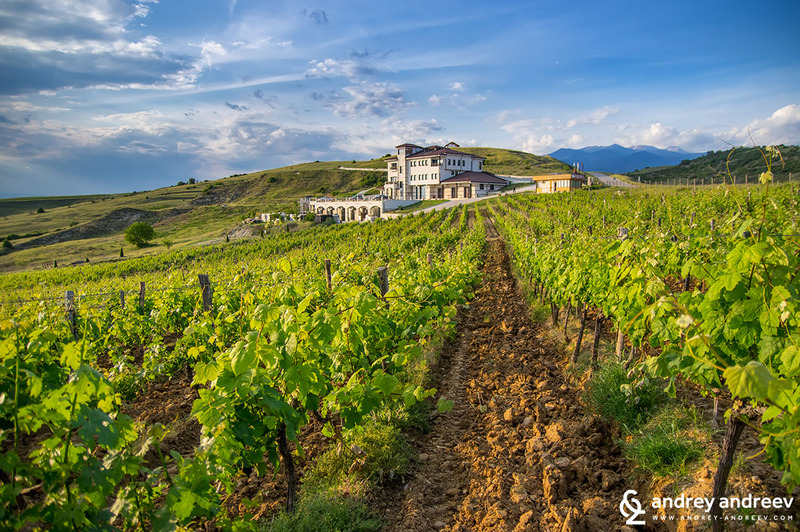 Among our favourite wineries are Villa Melnik, Maryan and Medi Valley, but there are many others worth tasting. 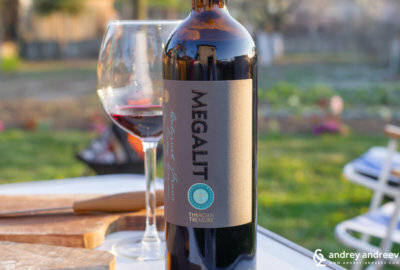 We always buy wine from the wineries we visit but if you can’t go there, there are many wine shops where you can find wine from various Bulgarian wineries. One of them in Sofia is Vino Orenda, specialized exclusively in Bulgarian wines and offering something from almost every winery in Bulgaria. Where to find Vino Orenda. There is nothing too special about Bulgarian beer but beer lovers will find several good local brands on the market. The most popular are Shumensko, Zagorka, Ariana, Kamenitsa, Stolichno, Pirinsko. Our favourite brand is Stolichno with its strong caramel taste. Earlier I mentioned Ayran (Айрян) – a drink made of Bulgarian yoghurt and water. Another typical but controversial drink is Boza (Боза). It is indeed slightly alcoholic and is made of fermented grains. It is usually consumed on breakfast with banitsa. But Boza has a very specific taste so be prepared for something unusual and not necessarily good-tasting. It is not a household product but it is actually a very Bulgarian product, being produced only in the village of Cherni vit, Balkan mountains. The shepherds there used to make white cheese from sheep milk in wooden boxes. 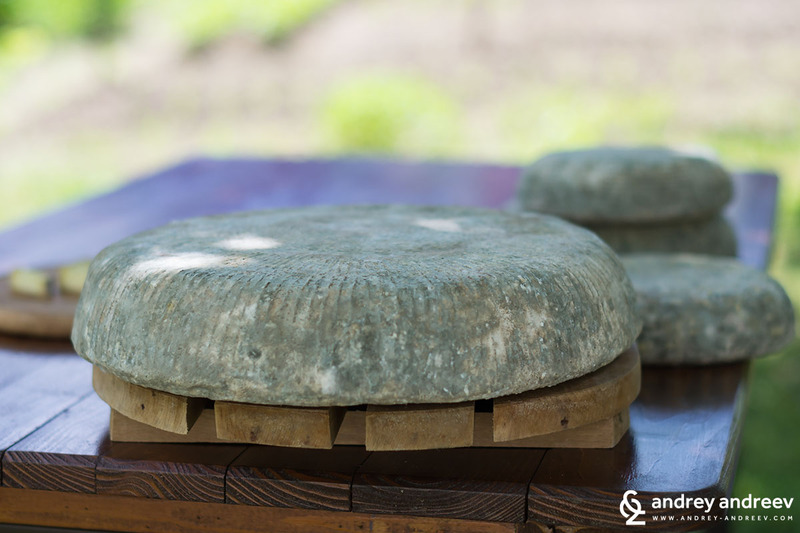 But after some time of maturing, it covered itself with edible green mold, similar to the one in the bue cheese varieties. Green cheese is not easy to find on the market but if you are enthusiastic – read where to find it. 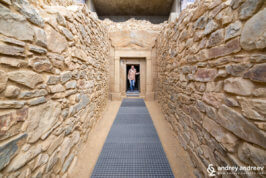 If you are planning a trip to Bulgaria for the first time and still wonder on the itinerary, we have something for you. 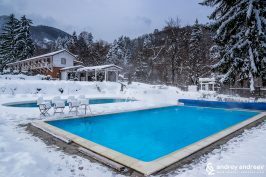 Read our article 5 days in Bulgaria – the must-do itinerary for the firs-timer, where we give tips and suggestions about the beat places to visit in Bulgaria, from the point of a local. 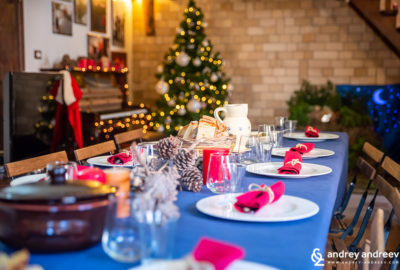 Even if you are not coming for the first time, check it out – you may discover something really amazing to add to your list for the next time. Mmmmm…reminding me of our trip to Bulgaria in 2006. We tasted almost all the foods you have listed, and loved most! We did not try tripe soup…. :-) I still make banitsa, shopska salad, kyufteta, and even my own version of lyutenitsa! Специална поръчка. Но иска много грижа :) иначе първоначалната инвестиция е лесна.